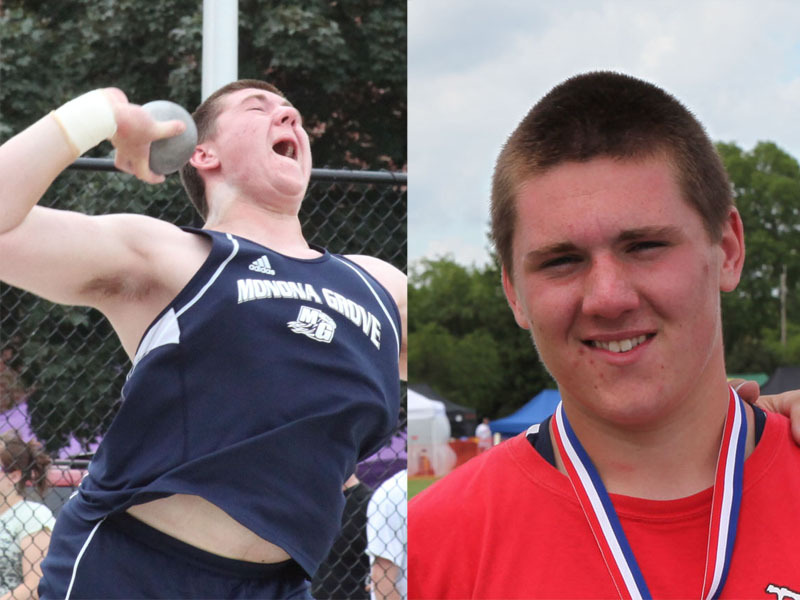 The 2012 Madison West Relays Class B meet offered a second playground for Madison Throws Club Throwers' Jason Zahn (sr) Grafton and Theron Baumann (sr) Monona Grove. There Battle at the Nelson Daniels Relays put them on top of the State honor roll list and this past Saturday offered up more of the same. Jason threw 58' 10.5" to capture 2nd place while Theron won the meet with a toss of 59'8.75". Theron's throw tied the B meet record set by Brodhead's A.J. Curtis in 2005. I suspect we could be hearing more from these 2 throwers at the TFA meet and beyond. Video of their 6 throws from the meet...and yes those are corn rows on Theron, I've threatened him with a haircut to no avail. Kailee Kamps, Belmont (sr) has finally gotten a couple of meets under her belt after a late start due to her and her Belmont Girls Basketball team's successful season. She didn't take long to get back into the groove. Kailee, who will throw for the University of Minnesota next year, was the runner-up in both the Shot Put and Discus at the WIAA D3 State meet last year. Kailee surpassed her shot put P.R. with a throw of 43'3.5" and in an early outdoor meet went 136'9" in the discus. Keegan Kamps, Kailee's freshman sister went 105'11" in the discus in her first high school meet. Dave's site also has an early season photo spread of some of the skilled girls throwers from around the state that return to compete in 2012. MTCer's Kailee, Keegan, and Paige Day are pictured. Congratulations to KeKe Burks, Madison LaFollette (sr) won the girls shot put at the 2012 Madison City Indoor Track and Field Championships on March 24 at the UW Shell. The University of North Dakota recruit threw for a new P.R. of 38'0.25". She had several throws that surpassed that mark but she could not stay in the circle on her bigger efforts. I believe there is more to come Ms. Burks. Many other MTC'ers got in the act sweeping the top 4 spots and 6 of the top 8 spots. 1. KeKe Burks, LaFollette 38'0.25"
2. Corinne Franz, Memorial 33'8.5"
3. Jessi Ford, Memorial 31'6.75"
4. Kariah Davis, LaFollette 29'4.75"
6. Christina McFeely, Memorial 28'6.5"
7. Allyson Opps, East 28'6"
At the first meet of the season we may have seen a preview of power in the Division 1 boys throwing events. Friday night at the Nelson Daniel's Classic, Madison Throws Club throwers Theron Baumann (Monona Grove) and Jason Zahn (Grafton) battled it out in the Shot Put. Baumann's throw of 60'3" won the meet with Zahn chasing at 57'8.5". Theron was rotating in the Shot Put for the first time in competition and broke the 60 foot barrier, it could mean the rest of the throwers in the state are on notice that bigger throws could come in June. Jason and Theron are the Top returning Throwers in D1 Boys throws. Jason has thrown the shot over 59' already this winter and was the runner-up in the Discus last year at state. 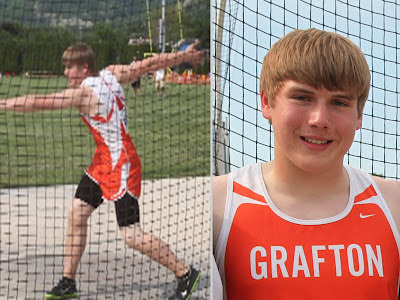 Theron had top 4 finishes in both the Shot and Discus last year. Great start gentleman and good luck in future competitions. 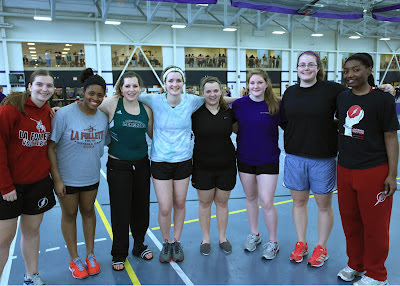 A good start to the season for many Madison Throws Club throwers. 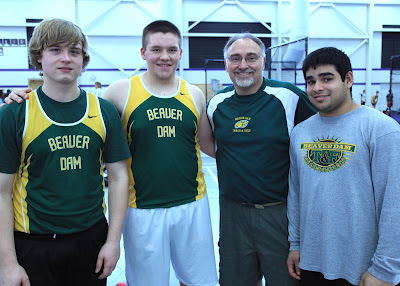 Congratulations to Beaver Dam junior, Riley Budde for winning the boys Shot Put Saturday morning. Riley was a state qualifier as a sophomore and is rotating in the Shot Put for the first time this season. Good luck the rest of the way to Coach Gruenewald and all of the Beaver Dam throwers. in the Girls Shot Put several Madison Throws Club throwers made their 2012 season debut with strong efforts. 5 MTCer's made Finals and claimed 4 of the top 8 spots. Your best throws are ahead of you, keep working hard! 1 Jasmine Townsend Niles West-Female 38'00.50"
2 Kaylyn Funk Janesville Craig 38'00.50"
3 KeKe Burks Madison LaFollette 36'01.00"
4 Taylor Price Beloit Memorial 35'07.00"
5 Haley Houser Stoughton 35'04.00"
6 Olivia Roehri Cary-Grove 33'00.50"
7 Corinne Franz JamesMadisonMemorial 31'11.00"
8 Jessi Ford JamesMadisonMemorial 31'06.50"
9 April McCarthy Stoughton 31'05.50"
10 Anna Wcislo Cary-Grove 30'08.50"
11 Hannah Johnson Sussex Hamilton 30'07.00"
12 Zaina Lalk Wauwatosa West 30'06.50"
13 Kariah Davis Madison LaFollette 30'06.00"
14 Vishna Patel Niles West-Female 30'03.50"
15 Kadijah Brandenburg Beloit Memorial 29'08.50"
16 Hailey Krahn Wauwatosa East 29'01.00"
17 Karli Bryant Verona 28'08.50"
18 Claire Fox Janesville Parker Gr 28'03.00"
19 Christina McFeely JamesMadisonMemorial 28'00.00"
20 Kayla Kingery Kettle Moraine Girls 27'11.00"
21 Erin Burmester Madison LaFollette 27'10.00"
22 Jennifer Janusz Sussex Hamilton 27'03.00"
22 Kari Mattison Verona 27'03.00"
24 tiasja green Milw. King 26'06.00"
25 Bekah Raebel Waterford 26'05.00"
26 Jessie Larson Janesville Craig 26'02.00"
27 Lindsay Hillmer Kettle Moraine Girls 25'00.00"
28 Katie Neubauer Waterford 24'10.00"
29 Abby Lane Beaver Dam 24'05.50"
30 Krista Robson Woodstock 24'05.00"
31 Kaleigh Seibel Woodstock 21'10.00"
32 Chelsea Fosse Woodstock 19'05.50"
1 Riley Budde Beaver Dam 52'06.50"
2 Trever Steinke Janesville Parker 51'08.50"
3 Joe Michaelson Hamilton 49'10.00"
4 Terrance Bramlett Niles West Boys 48'06.00"
5 Nick Ryczek Arrowhead 48'06.00"
6 Todd Blatnik Arrowhead 48'04.50"
7 Brandon Miller Waterford 47'07.50"
8 Austin Fisher Arrowhead 46'09.00"
9 Vance Luell Beaver Dam 46'03.00"
10 Keven Bell Janesville Parker 45'01.00"
11 Kevin Zarske Hamilton 44'11.50"
12 Brion Felix Wauwatosa West 44'09.00"
13 Paul Jacobson Janesville Parker 44'07.50"
14 Dan Martinez Beaver Dam 44'03.00"
15 Brandon Schindler Waterford 43'06.00"
15 SaQuan Dowery Milwaukee King 43'06.00"
17 Phil Krueger Woodstock HS 43'05.50"
18 Alex Frunza Waukesha North 43'05.00"
19 Zach Hartjes Verona 42'11.50"
20 Michael Vogt Wauwatosa East 42'11.00"
21 Jon Kalupa Brookfield East 42'08.00"
21 Brent Reierson Watertown 42'08.00"
23 Vince Schimborski Brookfield East 42'07.00"
24 Ronald Brown Wauwatosa West 41'11.50"
25 Max Monson Janesville Parker 41'11.00"
26 Ben Watters Verona 40'06.50"
27 Will Eden Janesville Craig 40'05.50"
28 Jack Maerz Oregon Boys 40'02.00"
28 DaQuann DeLeon Beloit Memorial 40'02.00"
30 Brock Milkent Waukesha South 40'00.00"
31 Charles Roberts Milwaukee King 39'05.50"
32 Kevin Karraker Wauwatosa East 38'07.50"
33 Alfonso Ocampo Waukesha North 38'05.00"
34 Derek Noska Waukesha South 37'09.50"
35 Marvin Triggs Morse-Marshall 37'08.00"
36 T.J. Fox Janesville Craig 37'00.50"
37 Tyler Parker Verona 36'06.50"
38 Kyle Patun Stoughton 35'08.50"
39 Cordel Weber Oregon Boys 35'03.50"
40 Kenny Robson Woodstock HS 35'02.00"
41 Edgar Ramirez Beloit Memorial 34'09.00"
42 Edgar Gonzalez Woodstock HS 32'08.50"
43 Jeremy Gartland Madison Memorial 32'05.00"
44 Dewayne Tidwell Milwaukee King 30'07.00"
45 Rodney Campbell Morse-Marshall 30'04.50"
46 Eli Linderud Stoughton 29'11.00"
As the competition season begins I wanted to take a minute to wish everyone good luck. If you are competing this weekend...don't over do it. Find a balance between the excitement of finally getting to throw in a meet and trying to do too much too early. Remember good form and technique now, will allow you to throw further as the season finds its way into April, May and hopefully June. Try not to throw further with pure brute force and leave all of the hard work you have put into good technique behind all for one measurement in March. Coach Sullivan thanks you for attending as do I. I like Coach Frederick's suggestion of writing a few things down that you learned or that coach's pointed out for you to work on...sometimes its easy to forget. Best of luck this season. If Madison Throws Club can be of any help this season or this summer feel free to contact me.